Matt Brown, Sports Shooter Academy co-founder and Los Angeles Angels team photographer, helps a workshop participant with a remote camera installation. Stuck in a photographic rut? Want to learn the secrets of using remote cameras? Gain insights into covering sports from preps to pros? Is networking with photographers from literally around the world important to you? Do you want to learn from some of the best photographers working today? There is still space in THE coolest sports photography event of the year Sports Shooter Academy 13, November 2-6, 2016 in Southern California. Sports Shooter Academy 13 continues the tradition of top-notch education and inspiration with a faculty of award-winning photojournalist. 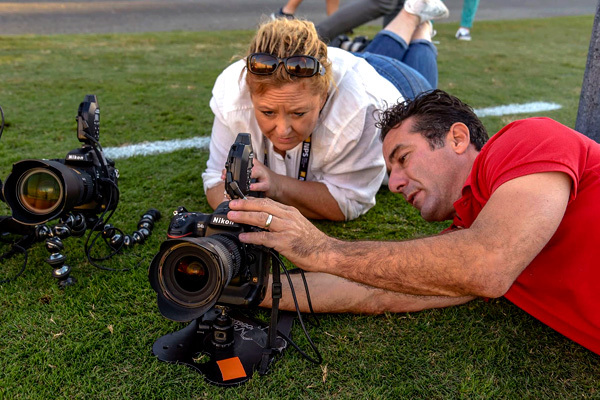 The mantra of the Sports Shooter Academy is "See Better, Shoot Better" and that is accomplished by covering real sports events like college football, soccer, volleyball, rugby, water polo and basketball under the guidance of the workshop instructors. Participants often cite the nightly one-on-one editing and critique sessions with the faculty as the highlight of their experience at the SSA. In addition to the instruction and inspiration you will receive at this workshop, participants have the opportunity to network with photographers and students from across the country and from around the world. This workshop is literally an international program with photographers traveling from South America, Europe, Canada and the Philippines to attend. "My experience at the workshop was nothing but positive. I came into it a bit nervous because I didn't know anyone and I was relatively new to the sports photo world in a professional sense. The faculty was extremely welcoming and helpful throughout the workshop, always answering questions and offering advice during critiques, as well as while we were shooting." The Sports Shooter Academy is sponsored Nikon Professional Services. NPS will be providing loaner equipment during the workshop and will have tech reps on hand to help with any questions about gear. College and university students: NPS will be paying the tuition for all full-time students accepted into the workshop. "For me the most helpful part of the workshop is that ability to be working in the field and talk through your shooting with the instructors themselves. Being able to ask what their approach would be; whether talking shooting position, lens choice, remote setup, or the moments they are looking for and then discussing the pros and cons compared to the approach you would normally take not only improves your photographs at the workshop but your entire thinking about shooting sports." 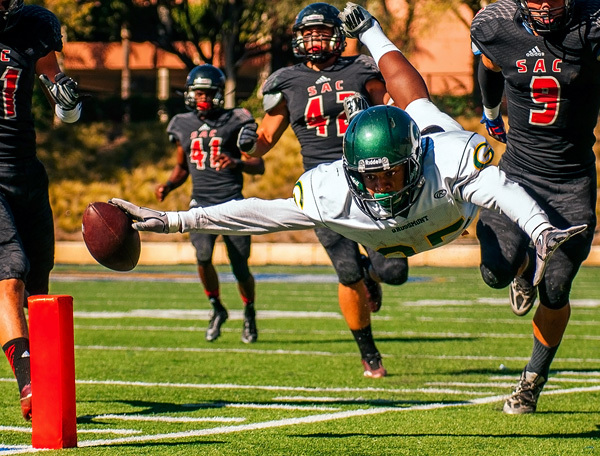 Grossmont College wide receiver Paul Gooden (85) dives for the end zone during the first quarter against Santa Ana College.